Web developer Adam Doppelt, creator of Urbanspoon, felt frustrated — he loved science fiction books but couldn't find ones he wanted to read. 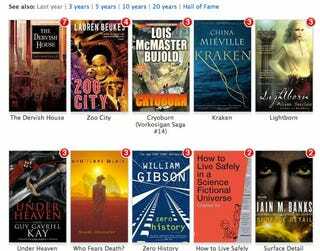 So he created BestSFBooks, a new "recommendation engine" for science fiction and fantasy books. So far, the site seems to be in its infancy, and it's just set up to recommend books that have won a lot of awards. (And books by award-winning authors.) At some point, Doppelt tells Geekwire, he may add a light element of reader voting.